Widespread suspicion about who is and isn't a citizen, heightened by the exclusion of over 4 million people from the National Register of Citizens 2018, is fueling a humanitarian crisis in Assam. National Register of Citizens (NRC) is a list containing names of Indian citizens of Assam. The NRC was first prepared in 1951, after the Census of 1951. 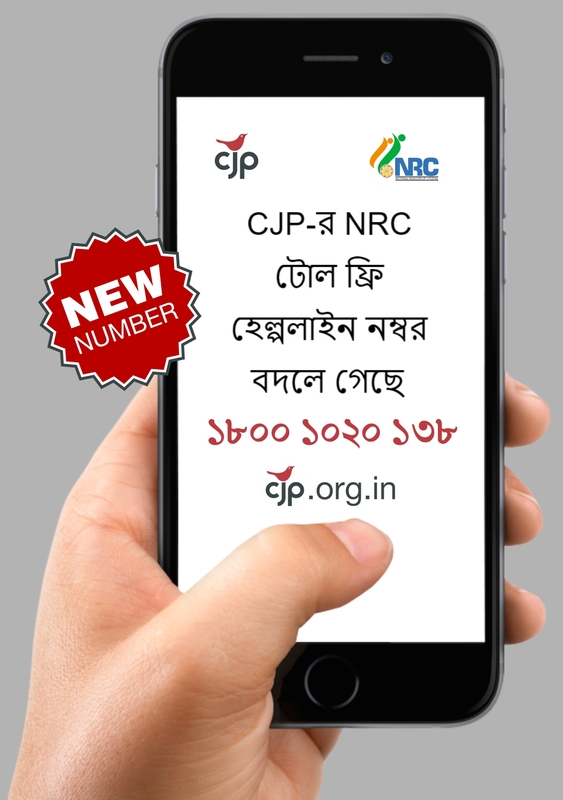 The NRC update of 2014-2016 across Assam includes the names of those persons (or their descendants) who appear in the NRC 1951, or in any of the Electoral Rolls up to the midnight of 24 March 1971 or in any one of the other admissible documents issued up to the midnight of 24 March 1971, which would prove their presence in Assam on or before 24 March 1971. The NRC (1951) and the Electoral Rolls up to the midnight of 24 March 1971 together are collectively called Legacy data. It is being done with the compliance with section 3 and 6A of Citizenship Act of 1955; the Citizenship (Registration of Citizens and Issue of National Identity Cards) Rules, 2003 (amended in year 2009); Modalities and Standard Operating Procedure and Judgement Order of Supreme Court. Entire process is being monitored by Supreme Court. Supreme Court in its order dated 25/10/2013 held the presence of D-Voters in the state doubtful and mentioned that these voters could be included only if the NRC is updated or the Foreigner's Tribunal declare them to be Indian Citizens. CJP reaches out to the people of Assam who are negotiating a labyrinth of citizenship related issues. Scores of our special volunteer motivators have spread out across many of Assam's districts and are helping people on ground with the claims and objections process. Additionally, we have also set up a round the clock toll free number to help people fill up the claim forms. National Register of Citizens (NRC) is a list containing names of Indian citizens of Assam. The NRC was first prepared in 1951, after the Census of 1951 to maintain a record of citizens. The Assam Agitation held between 1979- 1985 demanded the expulsion of 'foreigners' from Assam. This led to the updating of the NRC. The NRC process is meant to officially include the issue of illegal immigrants, specifically from Bangladesh. The recent draft of the NRC left out 4 million people out of the total 32 million plus applicants. The genesis of the NRC is linked to the movement against ‘illegal immigrants’ , ostensibly from Bangladesh. This movement has in turn sparked off violence against these ‘illegal immigrants’. 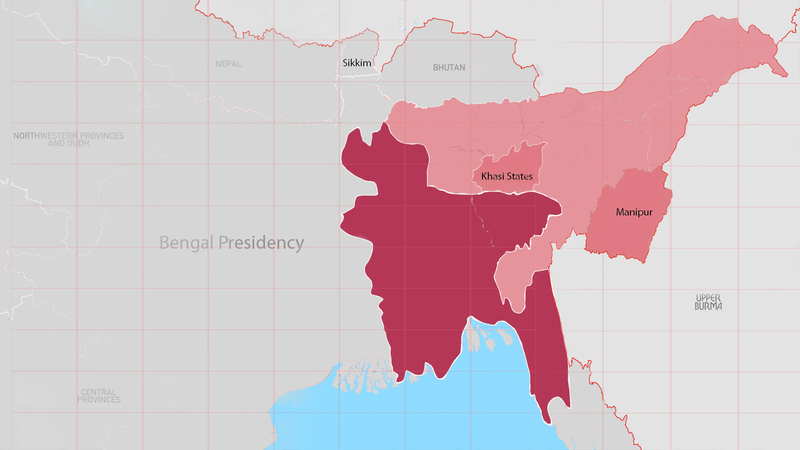 But what is the history of borders between Assam and Bangladesh ? What is the source of this disconent? 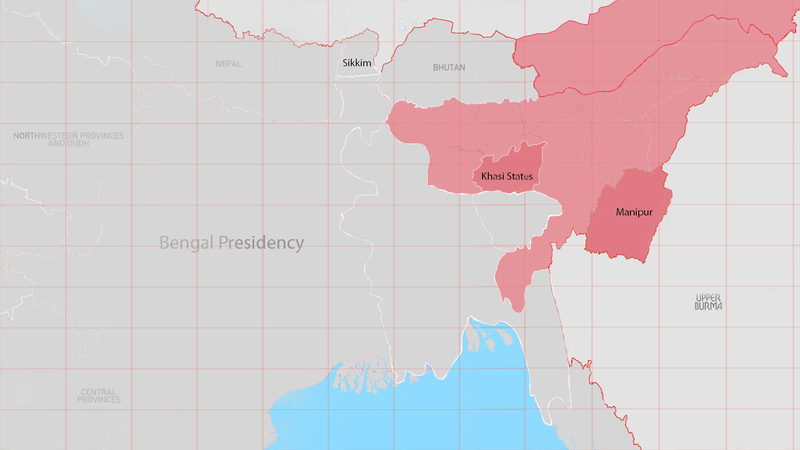 Watch our maps to see how ‘Assam’ changed over the years. Assam was ruled by various dynasties during the medieval period - the Pala, Koch, Kachari, and Chutiya. The Ahom kingdom established in the 13th century at the upper Assam plain gradually took control over the entire region. Although there was continuous warfare, the kingdom ruled for over 600 years until the 19th century. 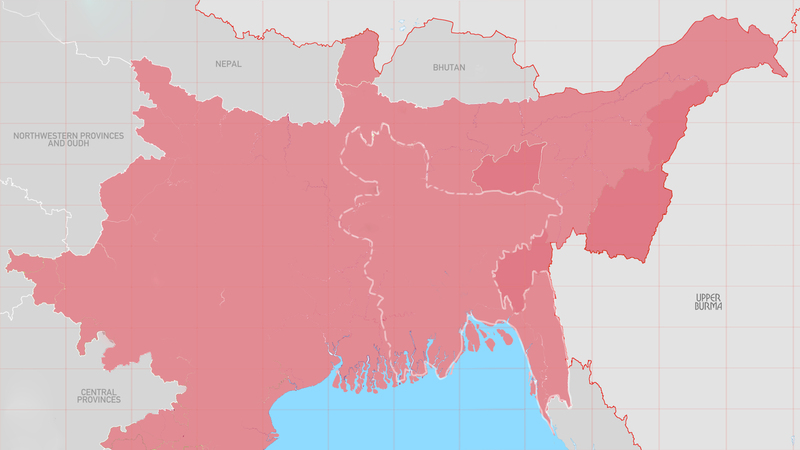 The present day Bangladesh and Assam were part of the British India till 1947. Until the idea of border came in, people have moved across this region freely. The British promoted the migration from the Bengal region to Assam for labour in the tea gardens and later for cultivation in the Brahmaputra valley. 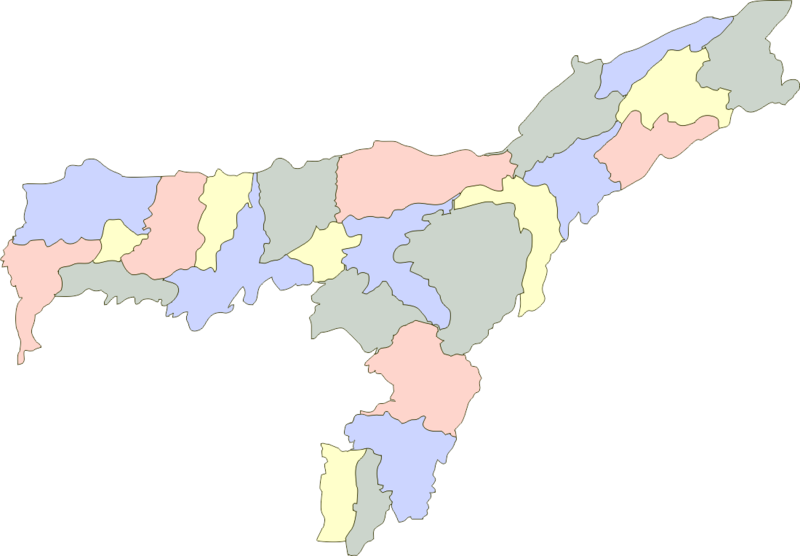 Chief Commissioner's Province (1874): Assam was separated from Bengal Presidency to for a new province. 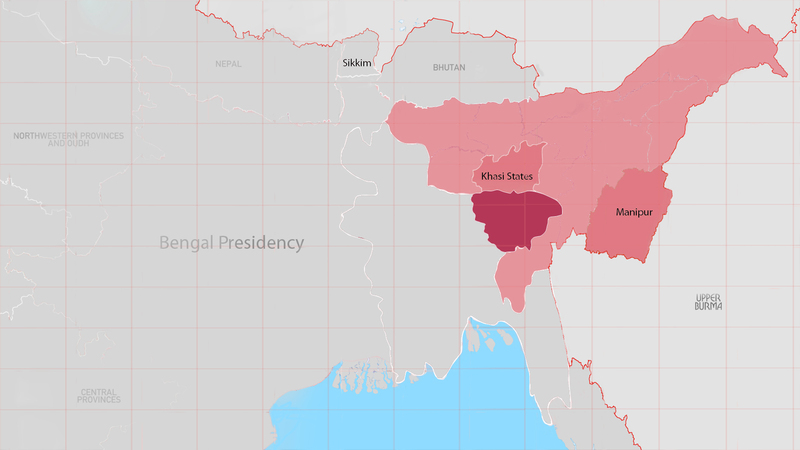 The Sylhet region of East Bengal is added to the Assam region. Chief Commissioner's Province (1905): Bengal was partitioned and the East Bengal region was added to the existing Chief Commissioner's Province. Detention Camps are places where the Assamese who are Declared Foreigners are kept till they are deported. Currently 951 DFs are lodged in 6 detention centers operating out of makeshift facilities in local jails in Goalpara, Kokrajhar, Dhibrugarh, Tezpur, Silchar and Jorhat. These detainees do not possess the same rights as the convicted/charged inmates and aren’t allowed to parole, family visits, and working for a wage. Meanwhile, the government has sanctioned over Rs 40 crores to set up a Detention Camp at Dhakurbhita in Goalpara. D voters are people whose position as voters is doubtful owing to lack of their ability to produce proper citizenship credentials. The Election Commission started classifying citizens as D voter in 1997. The Border Police would refer suspected foreigners to Foreigners’ Tribunals following which there would be a trial where they would be required to prove that they are genuine citizens. So far 2,44,144 people had been marked as D Voters till December 31, 2017. 1,31,034 cases had been disposed off and 1,13,110 cases were still pending. भला एक 8 साल का बच्चा ‘संदिग्ध वोटर’ कैसे हो सकता है ? The final draft of NRC was published today on July 30, 2018 and a number of people have been declared D voters. Monavar Hussain, an 8-year old boy is one among them – strangely, his parents are legal citizens. Foreigners Tribunals are the quasi- judicial bodies responsible for hearing cases with respect to foreigners/non-citizens/D-voters under the Foreigners Act, 1946. When the Border Police find a person’s citizenship suspect, that person has to prove his nationality within 15 days, failing which the case is referred to the local Foreigner Regional Registration Office. The Office conducts its own enquiries and if not satisfied the case then gets transferred to the FT..
35th Citizenship related Suicide in Assam! Assam Citizenship Crisis: Is Anyone Safe? Ten kilometers away from Morigaon town, ten members of the family of a former Deputy Speaker of the Assam Legislative Assembly have been accused of being foreigners. Reports say almost all residents of this village have been served similar notices. They all now, stare at an uncertain future. A Declared Foreigner is a person who has failed to prove his citizenship before a Foreigners’ Tribunal. Names of suspected foreigners and D Voters are referred to FTs who then conduct a trial where the proceedee is required to not only produce documents to prove their citizenship, but also prove the authenticity of the documents. If they fail, the FT designates them Declared Foreigner (DF). You have spent : minutes here, take 40 seconds more and support our campaign to stop the humanitarian crisis in Assam. Get involved in the debate on Twitter and Facebook using #AssamCrisis. Help the Assamese keep possession of their homes. Speak up. Sign our petition here.